I found this letter on a few different blogs. 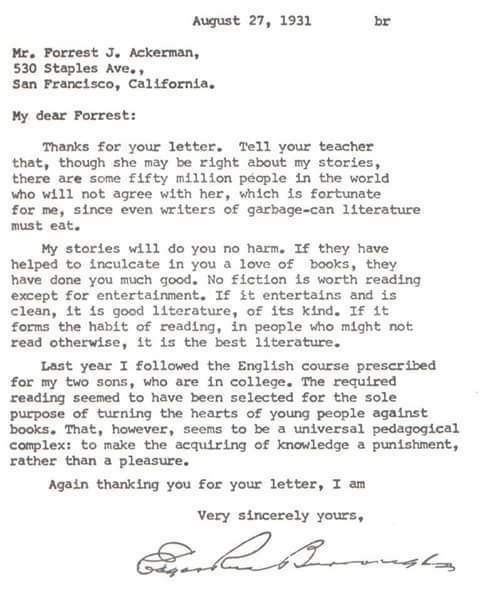 It’s a response from Edgar Rice Burroughs to a fan letter written to him by Forrest Ackerman (who, if you are unfamiliar, was a film historian, sci-fi fan extraordinaire, and founder of ‘Famous Monsters of Filmland’ magazine). Mr. Burroughs provides a wonderfully concise statement of the philosophy of the working writer. It is one that anyone who aspires to the craft would do well to consider carefully. As yet I have read two of Mr. Burrough’s books: A Princess of Mars and Tarzan of the Apes, and I found both of them to be, as he said, good, clean literature with probably more real wisdom and uplifting values than half the ‘important’ novels ever written. This entry was posted in Literature, Quotes by DBreitenbeck. Bookmark the permalink.